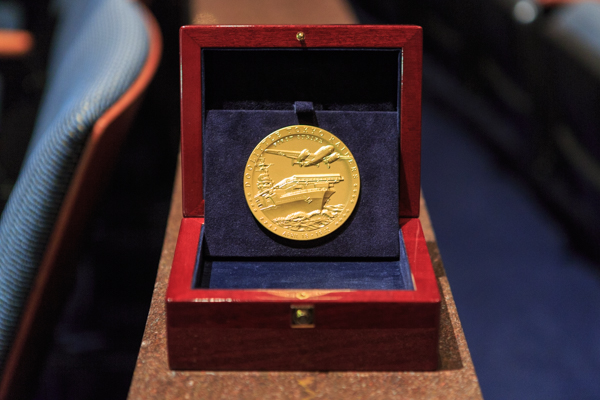 One of the greatest privileges of my job as Speaker is the opportunity to present the Congressional Gold Medal. A tradition dating back to the American Revolution, the Medal is the highest honor we can bestow for great achievements and contributions. The first recipient was George Washington himself, in the spring of 1776. What makes the Medal so American is that anyone can win it — whether you’re an astronaut, an airman, or an athlete. Of late, we’ve been honoring World War II veterans: the First Special Service Force, the Civil Air Patrol, and this week, the Doolittle Tokyo Raiders. The Doolittle Raiders are named after Lt. Col. James H. Doolittle, who, along with a band of some 80 airmen — all volunteers — conducted the first air raid on Japanese soil during World War II. Launched on April 18, 1942 in conditions more hazardous than anything they trained for, the raid changed the course of the war in the Pacific. On Saturday, 73 years to the day later, the two surviving Doolittle Raiders will present their Gold Medal to the nation’s Air Force Museum in Dayton, Ohio, where I know it will be in good hands. Dayton is essentially up the road from where I’m from in Southwest Ohio. Growing up, the one big thing we knew about Dayton was that it’s where the Wright Brothers got their start. On December 7, 1941, this sense of limitlessness, of why-can’t-I — what we often call our ‘way of life’ — came under attack. We were, for a time, a shaken people. How fitting, then, that to reverse our fortunes, we turned to that same source of ingenuity. To this day, we note that the air raid succeeded not just as a military action, but also as a restoration of that belief in ourselves. “A grand and glorious tonic,” the newspapers called it. FDR himself was so inspired that he came up with the idea to say the raids were launched from ‘Shangri-La,’ a place that exists only in literature. A number of journalists were fooled, to the point that one letter to the editor asked whether there was a town named ‘Shangri’ in Louisiana. The Shangri-La caper worked so well that the name was used for an aircraft carrier and what we now know as Camp David. Such is the magnitude of what the Doolittle Raiders did to revitalize the American spirit. We are handing this medal over to a museum — a great one, worthy of the Greatest Generation. But this Medal is very much a living testament to who these men were, who they are, and who they will always be: brothers in flight, like the Wrights themselves, inspiring us to attempt the unthinkable and achieve the unforgettable.